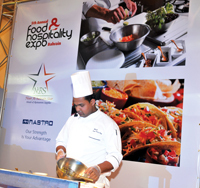 THE Bahrain International Exhibition Authority (BECA) has announced that the sixth annual Food & Hospitality Expo will run from April 15 to 17, 2014 at the Bahrain International Exhibition and Convention Centre in Bahrain. The show is one of the leading hospitality industry expos in the GCC and is now stronger than ever with an increase in companies participating each year, says BECA. This B2B event, which forms part of BECA’s annual exhibitions calendar, is dedicated to the food, beverage, hospitality and catering industries. Food & Hospitality Expo 2014 will bring together an international audience of buyers, retailers, distributors, food and beverage professionals and the relevant media providing an ideal opportunity to facilitate deals between buyers and sellers, importers and exporters worldwide. Bahrain has succeeded in combining new and modern styles of hospitality and has seen the industry grow in strength year-on-year with new restaurants and hotels being launched on a regular basis. The expo plays a key role in bringing together all the key players and showcasing what Bahrain can do in terms of international hospitality. Visitors to the event can also enjoy competitions by local chefs and get a taste of what the exhibitors have on offer. Early exhibitor bookings are encouraged to guarantee space for a special rate. The expo runs for three days and is open from 10 am to 7 pm daily with free entry to all.